An enlightened attitude towards scholarship does no good unless the gatekeepers of publication, funding, and academic appointment and promotion buy in to it. Q: How many academic faculty does it take to change a light bulb? A: Change?????? Nothing’s wrong with old light bulb!!!! In his book The Tipping Point, Malcolm Gladwell describes some of the elements that may facilitate this diffusion. Of course, if any group rejects the innovation, the innovation spreads less well. In fact, most innovations fail. Until market share reaches 100%, some oppose the innovation and, along with it, the early adopters. If the opponents are sufficiently powerful – then it is the second mouse that gets the cheese. The first mouse does not. or ‘the 3 Ps’. How well a scholar does these is more important than how a scholar does these. That is, this formulation is agnostic with respect to the vehicle through which the knowledge is publicized, the form of the peer review, and the nature or topic of the knowledge. Importantly, the 3 Ps can be achieved in many ways. For example, pre-print servers expose manuscripts directly before – and in some cases without – submission to a journal. These servers, some online journals, and other websites or blogs also enable peers to post comment visible to all. In some fields oral presentations at major meetings are the equivalent of publication. Sometimes the metric of scholarship is downloads of a computer program or app. Alternative metrics (altmetrics), also incorporating social media, have arrived. These developments challenge the hegemony of the traditional scholarly practices and journals, as have revelations of fraud. Can the assessment of funding applications be far behind? Indeed, crowdfunding of scholarship has begun. The innovators and early adopters continue: At the same time our own limitations as scholarly assessors have become apparent. We now know that features other than the merit of the work (e.g., the scholar’s race, gender, accent, appearance, and past and present institutional affiliations and trainers) can prejudice assessments, as can abuse of journal impact factors. Also contributory are confidential letters or reviews from writers who channel the above biases, add biases of their own, and write in ways prone to misinterpretation. The readers of these letters or reviews in turn parse them endlessly and strive to extract every last atom of nuance, even when none is intended. When we know these things, we can strive to mitigate them. But – innovators and early adopters beware! Laggards lurk! Life throws curveballs[11.5]. 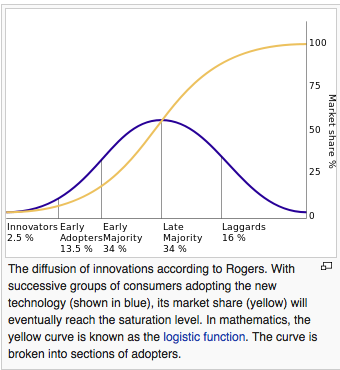 That fraction of the innovation curve that Rogers calls laggards and I will call traditionalists is still richly represented on most appointments and promotions committees, amongst peer reviewers, and on NIH study sections, NSF review panels, and the like. Despite clear criteria to the contrary, instruction/education concerning scholarship and its assessment[12.5], and abundant counterexamples, traditionalists will nonetheless favor work appearing in the right journals, previously funded by the right sources, and from the right institutions and supported by letters from the right people, in the worst cases irrespective of the work’s actual quality and impact. [To be sure, the quality and impact of scholarship can be correlated with journal impact factor, fundability, and institutional ‘brand’, except when they are not.] Given the traditionalists’ stature, power, and assertiveness, their views are challenging to dispute. What’s more, traditionalists are good at acculturating the impressionable in their traditional ways and thus in perpetuating their traditional views. At academic health centers, where scholarship is one of three allegedly equivalent missions, is a curious variant of this behavior. Given the reality of traditionalists, what is our obligation to our institutions, those whom we train and advise, and ourselves? What magic feathers do we provide? Do we say to fellow academics: do your best work and ignore the traditionalists? Or: Beware of traditionalists!! They may ultimately accept innovation, but not yet. To be on the safe side, be certain your work satisfies them. That is, strive for training and a position at the right institution, and for acceptance of your work in the high-impact journals. Cultivate traditionalists, defer to their views, and they may reward you with positive confidential letters. Remember: it is the second mouse, not the first, that gets the cheese. To be sure, the latter advice empowers and perpetuates traditionalists. No matter what the curve, some will lag; this is the nature of distributions and people. Experience suggests that those who lag are disproportionately senior, powerful, and are key gatekeepers in scholarly assessment. So it goes. If you’re into enlightenment, I’m afraid the solution is above my pay grade. Change may require that academic leadership at the highest levels repeatedly and publically recognize and reward those who produce high-impact scholarship that lacks the traditional hallmarks; i.e., emulate the Carnegie Foundation. Only when ‘the early majority’ see that non-traditional scholarship is not risky will they venture to undertake it, recommend it to others, and eventually help the traditionalists to accept it. OR postpone nontraditional scholarship and its advocacy until after tenure or it no longer makes a difference. √ Educate yourself about nontraditional thought on definitions of scholarship and its assessment. Educate yourself about implicit bias in the assessment of scholarship. √ A large literature exists on the mitigation of racial and gender bias. Consider whether its best practices can be applied to traditionalists. See How to Read a Letter of Recommendation, by Ira Melman. Samuel Karlin, the eminent mathematician and co-inventor of BLAST (https://en.wikipedia.org/wiki/Samuel_Karlin), was notorious for his letter writing. He would write only positive letters, but only for those who warranted positive letters in his judgment. The letters, however, read: “This person is a competent mathematician.” Period. Those in the know took a Karlin letter as evidence of extraordinary accomplishment. Those not in know dismissed these letters. For example, I have it on good authority that in one of our leading academic medical centers, confidential letters are deemed unreliable. Instead, members of the promotion committee are trained and expected to telephone experts, interrogate them carefully to uncover all weaknesses and strengths, find out who else can provide expert assessment, contact them, etc. [11.5]For those unfamiliar with sports or baseball metaphors, see http://www.urbandictionary.com/define.php?term=curveball . Rogers’ choice of this term is unfortunate, as most dictionary definitions are disparaging. No disparagement is intended. The chief procedural obstacle is the lack of a procedure. In the absence of formal reports on research, teaching, and service, the discussion is likely to be anecdotal and inappropriately personal. But formal reports harbor their own danger if the fact of them is taken as relieving others of the responsibility of reading the material. It should be a rule — it could only be self-enforced, but it would still have some effect — that only those who have done the reading can either talk or vote. The chief substantive obstacles to a rational outcome are all the bad reasons people have for voting one way or another — positive votes cast on the basis of friendship, pity, ideological fellowship, or fear of losing a line, and negative votes cast on the basis of ongoing quarrels in which the candidate had no part or as a payback for a vote taken last year or five years ago, or as a blow in the ideological struggle for or against the Old Guard. Given that these (and other) bad reasons are internal and often constitutive of the holder’s psyche, it is impossible to root them out or ban them, but you can make it more difficult to act on them by reserving the vote to those who have participated in the discussion or by requiring anyone intending to vote negatively to give some indication of that intention and some reason for having it. To its credit, a recent search at my institution sought to minimize the impact of ‘brand’ by removing all identifying information, including institutional affiliations and journal titles, from candidates’ applications. My favorite is a little-cited and originally ignored paper published in Verhandlungen des naturforschenden Vereins Brünn, a low-impact journal (if it still exists). The author had no grants, had studied at the University of Olomouc (not on anyone’s top 10 list), and had no academic position. Nonetheless, Gregor Mendel’s work became the foundation of genetics. Runner-up: the dude whose best work was published in Annalen der Physik after training at the Zurich Polytechnic (also not on anyone’s top 10 list) and who, like Mendel, had no academic position or grants when he wrote these. Also known as Albert Einstein. An excellent depiction of this is at https://www.youtube.com/watch?v=H0_EHJN_TDs , and in Greg Petsko’s account of the ultimate peer review ( 2008. Having an impact (factor). Genome Biology 9: 107 ). A shout-out to the Purdue ADVANCE program for producing the former. Three samples: http://www.ouchthatstereotypehurts.com/Pages/Ouch_Book.html ; Stone, J, and Moskowitz, GB. 2011. Non-conscious bias in medical decision making: what can be done to reduce it? Medical Education 45: 768-776. And a former Provost at my institution would routinely ask in tenure cases: Has the implicit bias in letters of assessment affected judgment? This essay was written in response to a prize contest. There are other examples, most notably that of Moses Mendelssohn. https://persistentenlightenment.wordpress.com/2014/03/18/moses-mendelssohn-on-enlightening-the-mind/. Whenever I see the term “enlightenment” used, I feel the urge to contextualize the term historically.